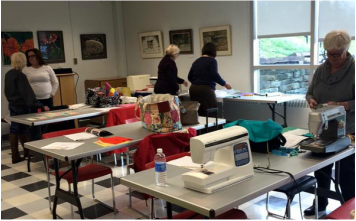 Quilt Company East members every year make many quilts for our worldwide community. Materials are all donated and members time and talents make beautiful quilts to distribute to those who need them. ​This program would not exist except for the energy and talent of the members of our guild. Our group gets together on a continuing basis to make quilts with fabrics that have been donated or from our own stashes. We supplement items needed to complete the project. Please check the latest newsletter for current projects. 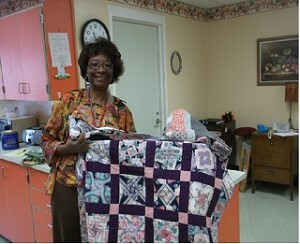 Pictured above is the representative from the Kane Facility with one of the many quilts we donated. She then took pictures of the quilts on the beds of the patients and sent them back to us with a lovely thank-you and an invitation to come back and teach the patients how to quilt. Also above is a typical work session for making quilts. Team work is so important for this project and our team is the best!